High lithium recoveries of 80-90% delivered from initial brine samples at Kachi Brine Project using Lilac Solutions process. Lilac process shows production of greater than 3000 mg/L lithium from average brine samples in a few hours. Increased recoveries indicate that a 300 mg/L lithium brine would produce similar volumes of final product as a 600 mg/L lithium brine. 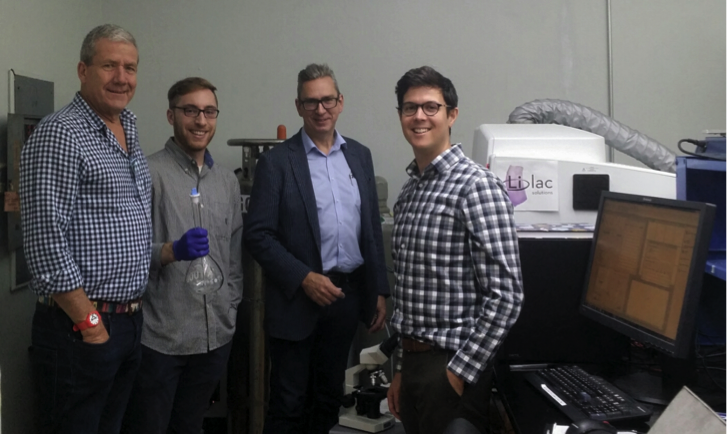 Partnership to advance a rapid, low cost method for direct extraction of lithium from brines at Kachi. Process aims to reduce lead time to production, operating costs and significantly increase recoveries. The new process appears more environmentally sustainable than traditional methods, is easily scalable to increase production and has a smaller footprint. Lilac now estimating operating costs for commercial lithium production at Kachi for direct production of lithium carbonate or lithium chloride – globally competitive cost anticipated. Argentine-focused lithium exploration and project development company Lake Resources NL (ASX: LKE) and Lilac Solutions, Inc. (“Lilac”) are pleased to report very high lithium recoveries from brines as part of Phase 1 engineering work to develop Lake’s 100%-owned Kachi Lithium Brine Project in Argentina (“Kachi”). Lilac is performing Phase 1 Engineering to optimise the Lilac system for the Kachi brine’s particular chemistry, establish performance of the system including lithium recoveries and purity of the lithium eluate solution produced by the Lilac system, determine the quantities of chemical reagents needed to drive the lithium extraction process, and estimate operating cost of commercial production of lithium. This follows the announcement in September where Lake and Lilac entered into a partnership to leverage Lilac’s proprietary ion exchange technology (the “Lilac Technology”) for the Kachi brine with the goal of establishing a rapid, robust, and low-cost process for producing lithium at Kachi. Lilac’s technology can economically access brines with low lithium concentrations and high concentrations of other salts, such as magnesium. Cost advantages come from reduced time, higher recoveries and a simplified extraction flowsheet with fewer reagents. The technology is modular to suit various project sizes and integrates with conventional plant designs for production of battery-grade lithium carbonate and lithium hydroxide. The technology has been successfully tested with real brine samples across the Americas. Lake and Lilac believe that combining Lake’s scale and project experience with Lilac’s technology and process expertise enables a rapid path to very large-scale commercial production of lithium at Kachi. “Lake Resources is delighted to see excellent results showing the potential of the Lilac process to deliver a rapid, direct extraction process of lithium from brines. The potential to reduce the timeline to production at low cost is a major advantage in the current market with a constrained supply of lithium. Increased recoveries indicate that a 300 mg/L lithium brine would produce similar volumes of final product as a 600 mg/L lithium brine,” said Steve Promnitz, Managing Director of Lake Resources. Figure 1. Conventional Process for lithium extraction of brines from evaporation ponds (left) versus Lilac’s innovative Ion Exchange method (right), which promises high recoveries in a few hours versus 9-24 months using evaporation to concentrate the lithium. Lilac’s method allows for the re-injection of brines to the aquifer from where it is sourced without significantly adjusting the water quality. Figure 3. Kachi Lithium Project showing drilling locations, details of the drill hole layout at each location and lithium concentrations for each drill hole which are averaged where multiple brine samples have been taken. Lake Resources NL (ASX:LKE, Lake) is a lithium exploration and development company focused on developing its 3 lithium brine projects and 1 hard rock project in Argentina, all owned 100%. The leases are in a prime location among the lithium sector’s largest players within the Lithium Triangle where half of the world’s lithium is produced. Lake holds one of the largest lithium tenement packages in Argentina (~180,000Ha) secured in 2016 prior to a significant ‘rush’ by major companies. The large holdings provide the potential to provide security of supply demanded by battery makers and electric vehicle manufacturers. The Kachi project covers 50,000 Ha over a salt lake south of FMC’s lithium operation and near Albemarle’s Antofalla project. Drilling at Kachi has confirmed a large lithium brine bearing basin over 22km long and over 400m deep. Drilling over Kachi is aimed to produce a resource statement in 2018, anticipated in Oct 2018. A direct extraction technique is planned to be trialled on site in tandem with conventional methods as part of a PFS to follow the resource statement. Scope exists to unlock considerable value through partnerships and corporate deals in the near-term. The three key brine projects, Kachi, Olaroz/Cauchari, and Paso, are located adjacent to major world class brine projects either in production or being developed in the highly prospective Jujuy and Catamarca Provinces. The Olaroz-Cauchari project is located in the same basin as Orocobre’s Olaroz lithium production and adjoins Ganfeng Lithium/Lithium Americas Cauchari project, with high grade lithium (600 mg/L) with high flow rates drilled immediately across the lease boundary. A drill rig has commenced at Cauchari with results anticipated to extend the world class resources in adjoining properties into LKE’s area with results anticipated from late October into December 2018. This will be followed by drilling extensions to the Olaroz area in LKE’s 100% owned Olaroz leases. The demand for lithium continues to be strong for lithium ion batteries in electric vehicles, according to recent data from the leading independent battery minerals consultant - Benchmark Mineral Intelligence. Supply continues to be constrained suggesting good opportunities for upstream lithium companies for many years.